Monroeville, PA - On Sunday November 13, 2016 anticipation and excitement for the arrival of His Grace Bishop Irinej filled the air for weeks. Finally, the day arrived and what happened next will live in the memory of all especially the children who had prepared to greet him. Instead, he greeted them! As he entered the west doors of the church the children were waiting. Stepping into the door he immediately crouched to the height of the children. He talked and spent time with the children as though there were no others near by. It was clear that both His Grace and the children enjoyed their time spent together. To some adults present it was reminiscent of times they spent during their childhood with Sveti Vladika Nikolaj Velimirovic. The St. Nicholas Choir sung the beautiful hymn ‘Dostojno Jest’ (It is Truly Meet) as His Grace entered the nave. Heads turned and faces light up with smiles. While Bishop Irinej was vested in front of the Holy Altar, the Parish Priest V. Rev. Fr. Dragoljub Malich, assisted by visiting priest Rev. Fr. Dragan Zaric of Johnstown, PA observed from within the altar. It has been sometime since we witnessed the Vesting of a Bishop. It was welcome and refreshing. Throughout the entire Hierarchal Divine Liturgy, parishioners were intensely focused on the altar and His Grace Bishop Irinej's sermon. Following Hierarchical Divine Liturgy everyone retired to the Social Hall. While waiting for the arrival of the V. Rev. Fr. Stevan Stepanov, retired Dean of the Eastern Diocese, and Protinica Ana, V. Rev. Fr. Rade Merick, Dean of the Eastern Diocese and Protinica Donna, and Rev. Fr. Rumen Stoychev of Youngwood, PA. Our faithful and our guests were delighted with the ease and opportunity to personally be received by His Grace Bishop Irinej. After dinner, one could hear a pin drop, as His Grace addressed the capacity crowed. A program followed which included the St. Nicholas Choir, Junior Choir and St. Nicholas Tamburitzans. The entertainment was clearly enjoyed by His Grace and other guests. 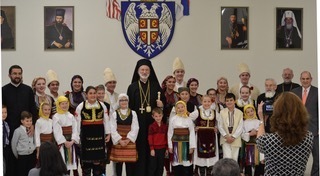 We of the St. Nicholas Church School parish family, were honored by the visit from His Grace Bishop Irinej. His visit generated a renewed spirit of enthusiasm for the future of our church. We anticipate and look forward to his ongoing visits to St. Nicholas of Monroeville. Let us pray that the present and future of all Serbian Orthodox Churches in the Diocese of Eastern America, under the guidance and direction of Bishop Irinej, will prosper and experience success!